Flickr member Matthew Stoller captured the sign below on the side of a food truck (aka Roach Coach or mobile fast food) in Nebraska. The sign is selling a specialty of the truck: The Hot Beef Sundae. "Golden mashed potatoes covered with a generous portion of our roasted and seasoned to perfection top round beef. Then aged cheddar cheese, more golden mashed potatoes smothered with our special beef gravy, more aged cheddar cheese, a slice of buttered toast and a cherry tomato on top. A delightfully satisfying meal that you will crave time after time, year after year." Reminiscent of a KFC Famous Bowl? I sure don't have (and wouldn't want to see) the nutrition facts for this baby! The cherry tomato on top is a nice touch though! UPDATE: Failing to find a Hot Beef Sundae to buy, The Davis', on their Off The Strip blog, have come up with their own Hot Beef Sundae recipe. 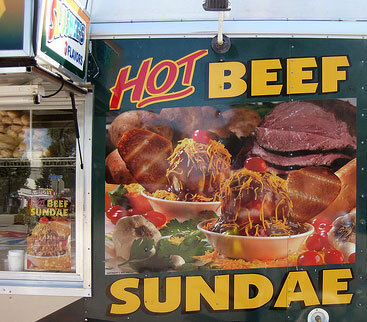 UPDATE2: BoingBoing: "Hot beef sundaes: an unstoppable trend" has another fair photo. Who cares what it's called. It looks frickin' delicious to me.